WikiLeaks founder Julian Assange said he stands by an earlier pledge to face trial in the U.S., but he is first urging federal investigators to name the exact charges against him. Assange previously made his pledge on the condition that President Barack Obama grant clemency to Chelsea Manning, a former U.S. soldier who was jailed for disclosing sensitive documents to WikiLeaks back in 2010. On Tuesday, Obama commuted Manning’s sentence. She’ll now be released in May, after service nearly seven years behind bars. However, Obama said his decision had nothing to do with Assange’s offer, even as the U.S. may be building a case against the WikiLeaks founder for publishing government secrets. 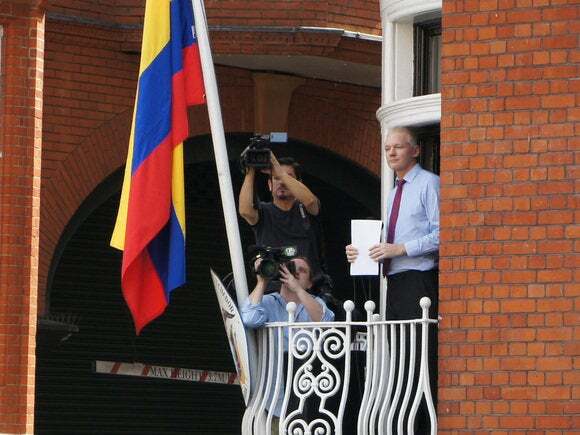 Assange is currently hiding out in the Ecuadorian embassy in the U.K., where he’s been granted asylum. Swedish officials have attempted to extradite him over alleged sexual offenses, and the FBI has suggested in court documents that it’s pursuing a case against Assange for his involvement with WikiLeaks. However, the DOJ on Wednesday declined to comment on the matter and wouldn’t say whether the U.S. government is even seeking Assange’s extradition from the U.K.
On Thursday, Assange said the U.S. is deliberately hiding details of the charges against him to prevent his lawyers from effectively fighting back. Despite his earlier pledge to travel to the U.S., Assange noted that Manning won’t be released until May. Before that time, he hopes to have “many discussions” with the Justice Department. However, Assange called Manning’s release a “strategic victory” when the Obama administration has cracked down on journalists and whistleblowers circulating sensitive information. “If it takes me going to the United States to somehow flush out this case … then we are interested in looking at that as well,” Assange said.